These are great. I am buying a second pair to keep at work. The sound is great, especially for the price. They also have a pretty long cord, which is great for me, as the standard 3m cords are too short in my opinion. Sound Good but small for over the ear. These sound great. Definitely the best sounding headphones I have bought that are under $20. The slots for the ears are a bit shallow so if you don't have really flat ears they will still press on your ears a bit; not as much as on the ear headphones would but more then I would expect an over the ear headphones would. Impressive bang for the buck! I own and have owned some great sounding phones(IMHO). 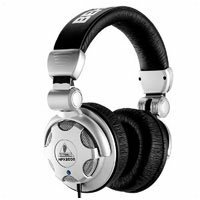 (BeyerDynamic DT 880's(current favs), Sennheiser 201's-202's & HD 570's,Sony's(low budget) and some Yamaha's) I was impressed by the Behringers. Crisp and vibrant highs with very decent low end soundstage for open air phones. I broke them in for a day and I was pleased even more. I have red reviews on audiophile forums that won't even smell them and I just can't see it. I mean they are $20! You aren't going to get leather and magnesium frames for that price range..lol Comparatively Sennheiser 201's run at a similar price range and they are excellent for the price. I like the low end on the Behringer's a little more. Behringer doesn't have the history that Sennheiser does but the performance is there. You also get a few extra features like a single side cord, 1/8 inch plug with a 1/4 inch screw on adapter(L shaped plug). TheBehringer's are also a bit more comfortable than the 201's and 202's with DJ functionality and adjustable headband. A couple of things to note - it looks like these have the huge foam pads that go around your ears. They don't (the pad sits on your ear). I find the other style is more comfortable if you're going to be listening for a few hours (that's my reason for knocking 1 star off). Otherwise, they're pretty comfortable. And as mentioned, the noise isolation is nil. In fact, it's almost like they tried to interfere as little as possible. It is really nice that I can hear everything going on around me. It feels like using speakers, except I'm not broadcasting what I'm listening to.